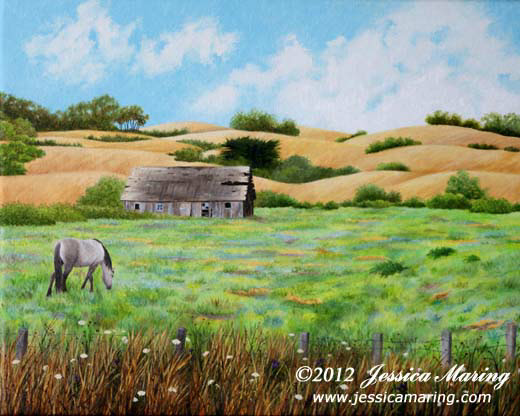 This old barn is just a short distance north of Half Moon Bay, off of California’s Highway 1, and visible from it. I passed it dozens of times, thinking that it would make such an interesting painting, until one day I finally stopped and took photos of it. Most of my paintings are of a particular scene and are fairly true to it. This one, however, is a composite of elements. There were horses in the meadow by the barn, but they looked as old and decrepit as the barn, so I “borrowed” a handsome horse from another meadow near my house. The view of the golden California hills are from another road near the old barn, and the foreground weeds from the unmown verge of yet another meadow.